The weather is FINALLY changing here in Georgia, and I cannot tell you how nice it is to actually step outside and NOT get a slap in the face by that thing we call…. heat. 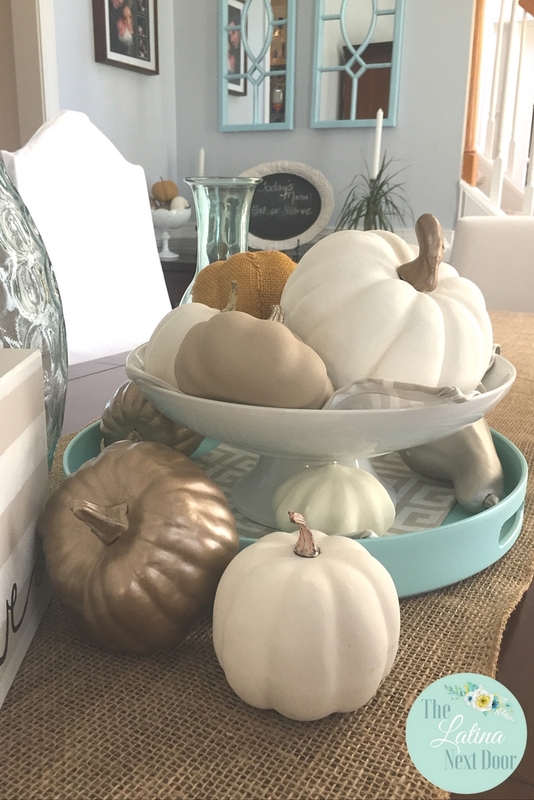 I have been having some fun changing some things around the house, adding some touches here and there of fall decor. And while I really don’t do a lot of decorating all over the house for Fall, I like to change out the dining room since it is the first thing guests see when they walk in our home. 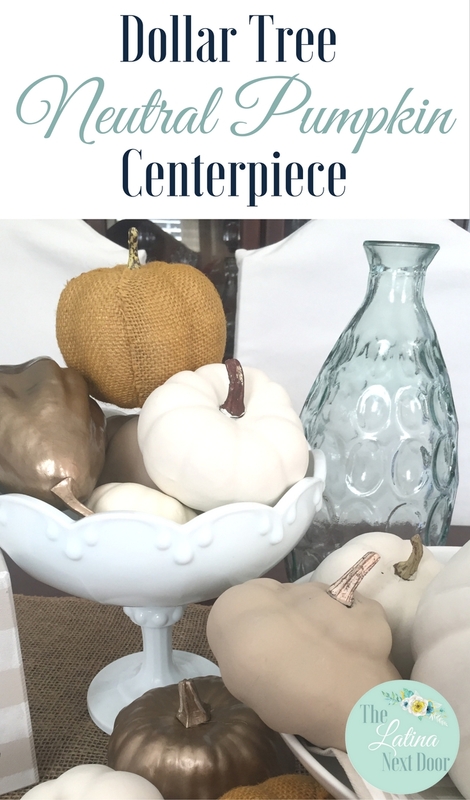 I decided create a fall centerpiece for the table that was neutral and could be changed up easily, not break if one of the kids got a hold of it and of course, cheap! So I decided to go to my local Dollar Tree and get me some dollar pumpkins. They came in these deep fall colors, which I am not really a fan of so I decided to change them up by painting them. 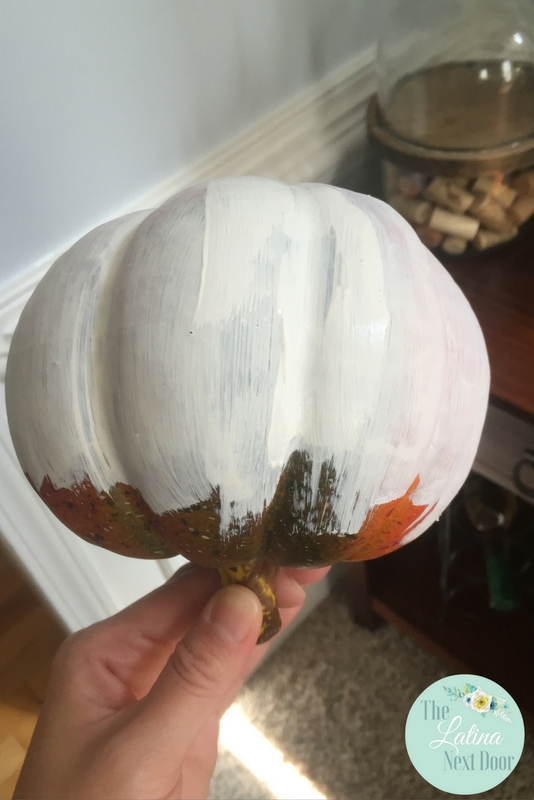 I used this acrylic paint from Hobby Lobby for the pumpkins. They are super cheap! And then used these foam brushes from Home Depot to apply the paint. I just started from the bottom and worked my way up. 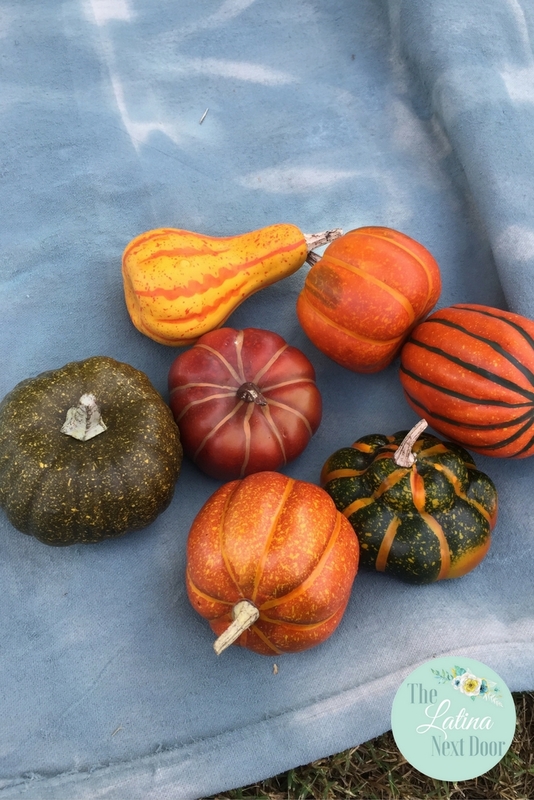 I used white, beige, gold and silver for my pumpkins. 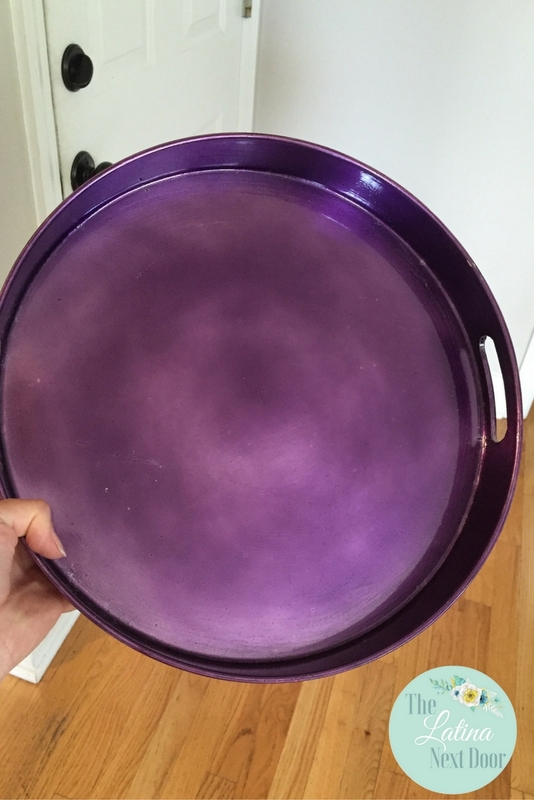 Then I remembered I had this ugly tray doing nothing but taking up dust in my office, so I sprayed painted it too. I bought it from Hobby Lobby on clearance for like $5! 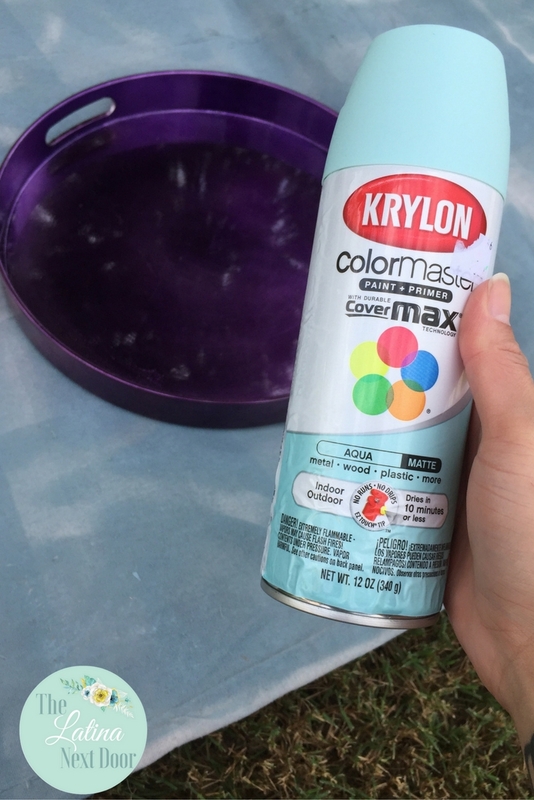 I used the following spray paint and color which I got at Hobby Lobby as well. I know it’s not a “Fall” color but you know me and blues! And I also wanted to be able to use it all year round. Then I remembered I had scraps of fabric left over from my dining room chair makeovers and my DIY table runner so I sewed up these little squares to place in the tray. Then I just added elements here and there. I even added this lovely milk glass vase that I scored over the weekend at Goodwill for $0.99!!!! Can you believe it??? I even added another cake stand I already had to see if I preferred all white. 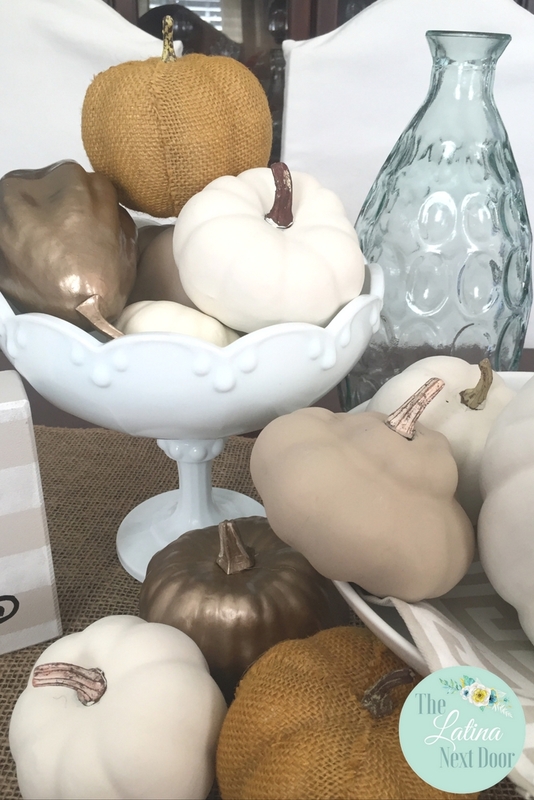 And those cute little burlap pumpkins were from Dollar Tree as well. They were too perfect to even change! 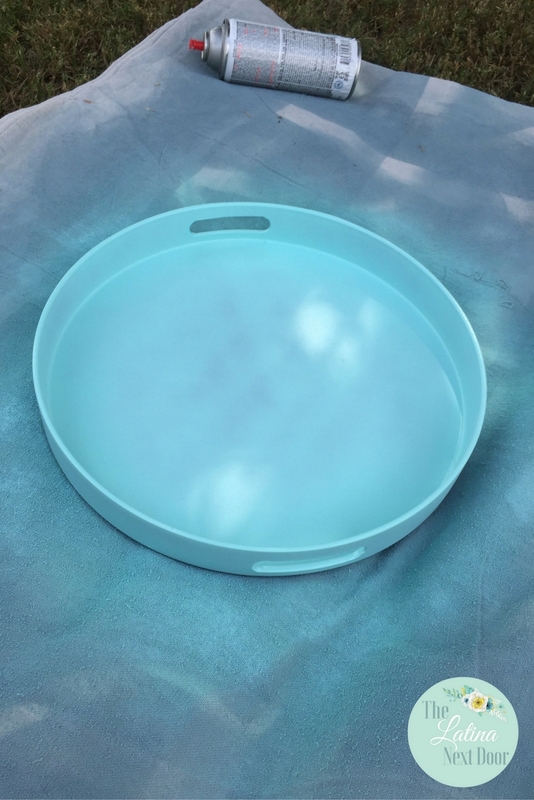 Then I put the cake stand in the blue tray for more contrast. 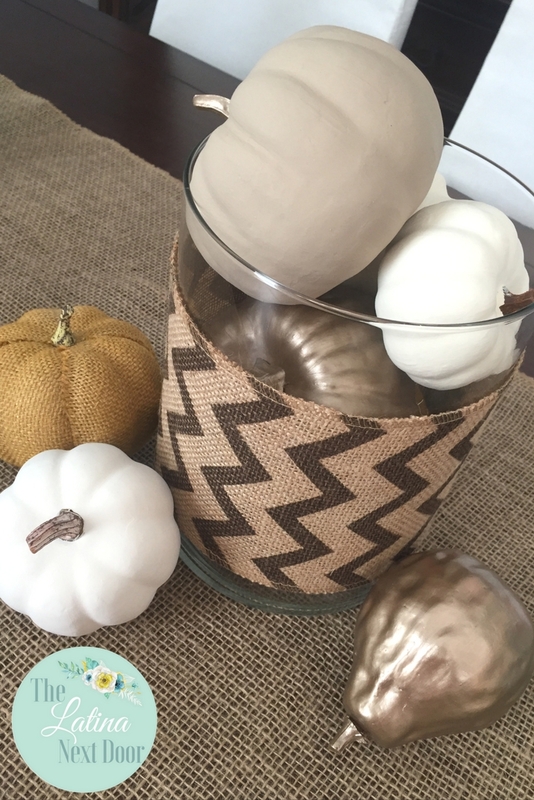 You can even go simpler and just add pumpkins to a glass vase with some burlap ribbon wrapped around. I had fun with this super simple and affordable project. 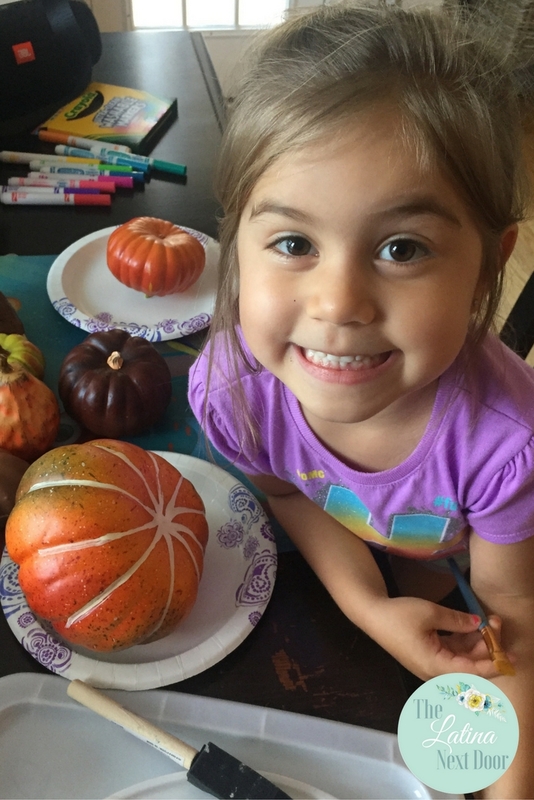 My daughter even got in on the fun with painting the pumpkins. Another great item for the Fall Bucket List! By the way have you gotten your copy? Snag your FREE printable right here! The best part about these pumpkins is that I know the kids aren’t going to shatter them if they grab them and sling them across the room (not that they would do that, just saying!). And if I get “tired” of the arrangement I could rearrange it and do something else! 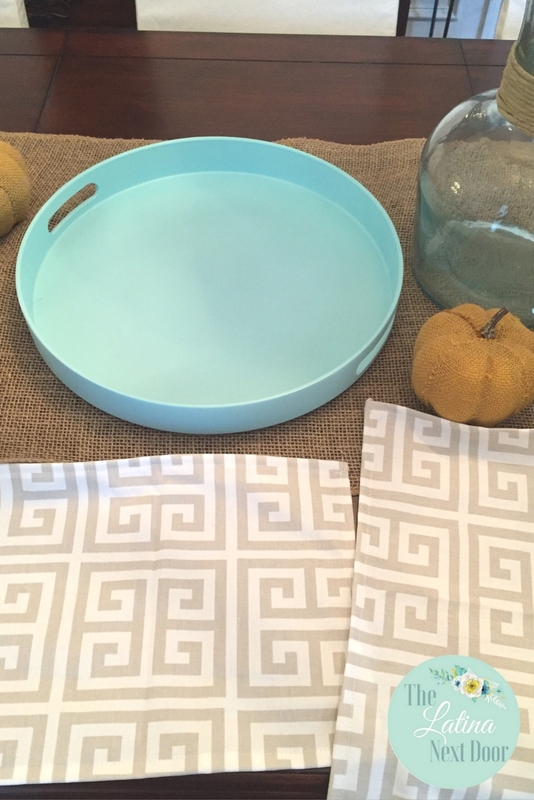 Just remember that just because everything is orange and yellow for Fall, it doesn’t mean you can’t do something neutral like this and still be festive. This isn’t the most swankiest centerpiece out there, but it’s mine and I was able to enjoy some time with my little girl, which is what the holidays is all about, right? 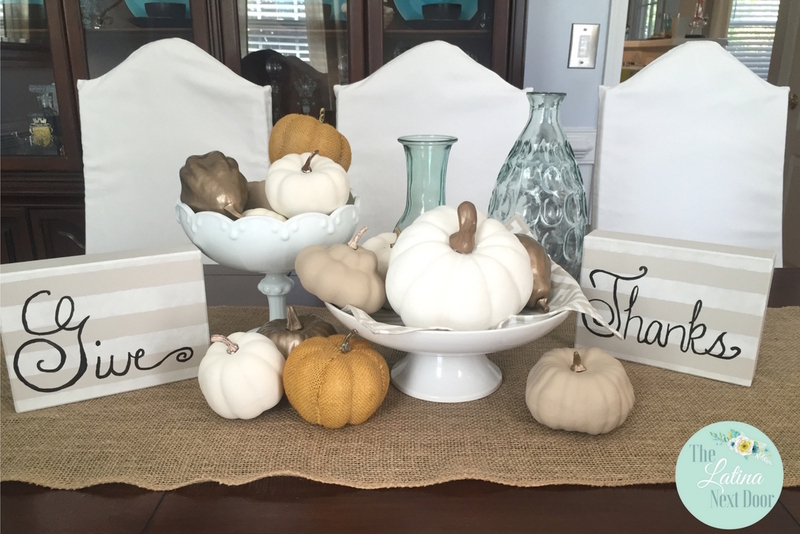 What do you do for fall decor around the house? Hope you enjoyed the post! If you have any questions, be sure to post them below! Oh man I love the dollar store and all the ideas and pretty things we can make from there! Your center piece looks beautiful! Mihaela, yes! 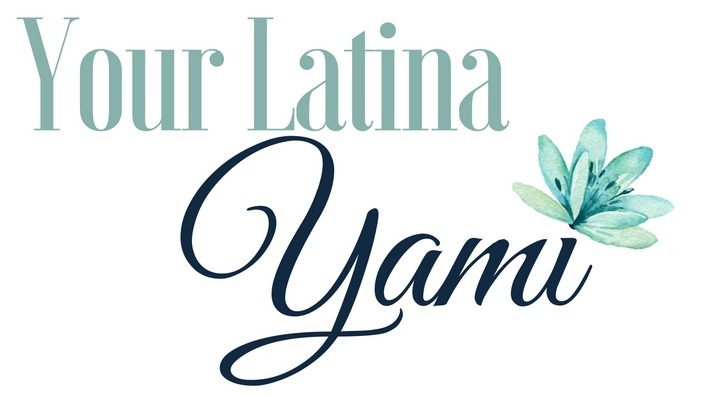 I love going there to see what I can score for super cheap! They have some great items sometimes. And thank you for the compliment! Glad you liked!